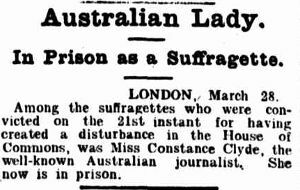 The following article about a female prisoner recalling her time inside Boggo Road is adapted from Brisbane's Daily Standard, April 1935. The subject is Constance Clyde, who was born in Scotland in 1872, moved to New Zealand as a child, and then on to Sydney in 1898. She wrote for the Sydney Bulletin, and penned the novel A Pagan's Love, in which ‘questions of women's dependence were raised, with the heroine considering an extra-marital relationship with a man’. As a reporter, she was imprisoned in England in 1907 as one of the suffragettes who ‘caused a disturbance’ in the House of Commons. A similar protest scene was depicted in the inspiring 2015 movie Suffragette. Clyde wrote of some her experiences as a protester in this 1907 article. She also provided this excellent account of her time in London's Holloway Prison that year. 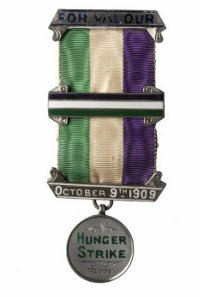 Silver hunger-strike medal presented to the Suffragette prisoner Lady Constance Lytton, October 1909.